Christopher Jerry, President and CEO of the Emily Jerry Foundation, will address the AAMI 2013 Conference & Expo (June 1-3, in Long Beach, CA) on ways to change the culture of healthcare to reduce medical errors. His presentation ties in well with the mission of AAMI, an alliance of more than 6,000 healthcare technology professionals dedicated to advancing the safe and beneficial use of medical technology. AAMI’s members work to improve medical device safety through the development and use of AAMI standards, professional certification, education, summits and other technical resources. AAMI 2013 will include a full program of educational sessions devoted to patient safety, addressing such critical issues as human factors, electronic medical records, power-strip misuse, sterile processing, alarm fatigue, and much more. Full details about the conference are at www.aami.org/ac. Shortly after my two-year old daughter, Emily’s, tragic death in 2006, I began this journey I’m currently on as a full time patient safety advocate. As it still is today, my primary emphasis when I first began my advocacy efforts, was to focus on ways to influence positive change in our nation’s medical facilities that would help minimize the probability of “human error” occurring, on the part of caregivers in medicine. My thought, when I first started, was simple. If I could put all of my time and energy as an advocate, each and every day, into this one particular area of preventable medical errors, ultimately it might end up saving others from a similar fate as my beautiful Emily. I felt very strongly that if this work that I had chosen to do as an advocate, ended up saving only a few lives over the course of time, then all of the hard work would be worth it. More importantly, I couldn’t think of a better way to honor my daughter Emily’ short life. Additionally, I truly thought these efforts would make her tragic death less senseless. Through this work as an advocate, I never really knew the profound healing that would occur for me on a personal level, as Emily’s father. I now believe that this is just one of the many blessings given to me by my little girl. It’s this type of healing process that can occur, for anyone who has experienced or is going through a life-changing crisis, that cohost Joni Aldrich (www.jonialdrich.com) and I, will be discussing on our new weekly show called ADVOCACY HEALS U. Please join us every Tuesday at 2:00pm EST and find out how to be an advocate for positive change and how it can, subsequently, heal and inspire you too! Over any web enabled device, you can listen to the show by either going to www.W4CS.com or www.W4WN.com. If you happen to miss a show it will be rebroadcast each Saturday at 3:00pm EST. Click Here to Listen to the “Advocacy Heals U” Audio Promo! On the Morning of May 8th I was honored to give the keynote presentation at Kroger Pharmacy’s Annual Medication Safety Summit in Cincinnati at, of all places, Paul Brown Stadium (I honestly didn’t even realize it was going to be there until the night before the event!). Due to the fact that over the past few years I’ve been focussing all of my time related to medication safety, on clinical pharmacy, I honestly didn’t think too highly of retail pharmacy in general. To make matters even worse, I had such negative experiences recently with the Walgreens lobbyists in the Florida Senate, over my opposition to Florida’s SB818. I must say that Kroger Pharmacy changed ALL of my negative opinions and thoughts during the course of this engagement! Every single pharmacist, pharmacy technician, and upper level management person I met, I now consider the “rockstars” of retail pharmacy! Kroger Pharmacy is the new “Gold standard” in my mind, for putting their customer’s safety, BEFORE profits. I will subsequently use their example for the other retail pharmacy chains, in terms of my core expectations, going forward! As you can tell, I was pretty impressed with what I found within the Kroger Pharmacy culture. The feeling was mutual as attendees of the event seemed to be truly touched by my story as well. Below are some very kind notes I received as a result of the presentation. This kind of feedback really inspires me to keep moving forward, inching closer to the goal every day of safer standards for our patients, and reducing the human error component of medicine. My name is Casey and I met you this week when you spoke to the group of pharmacy managers and lead technicians for the Kroger Company in Cincinnati. I would first like to thank you again for sharing your story with us and commend you for your strength and compassion. It is rare to have such powerful qualities in the face of such adversity and I can only pray to have a fraction of those qualities for myself. I cannot express exactly how much Emily’s life and story moved me. As a new parent, this story was especially impactful, and I again marvel at your courage. Your work in advocating medication safety is admirable in itself, but is exponentially more moving when the tragedy of Emily’s death is added. I am a member of our division’s Medication Safety Committee and it is extraordinary to me that anyone outside of the pharmacy profession would work so passionately to enhance our practice. Patient safety has always been a focus of mine and I hope to instill that in every member of my staff. I was hoping you could direct me to where I could find the video clip you showed us at the beginning of your presentation. I conduct quarterly staff meetings and I would like to show my staff the video and share Emily’s story with them at our next meeting. I would like to use any means available to impress upon my staff the importance of the work they do and how impactful it can be. Also, I would like you to know that in an effort to make our pharmacy as safe as it can possibly be, I have banned all use of cell phones within the pharmacy. It is a small step, but a change I could make quickly and something I feel will be very impactful on the focus of attention for my staff. Again, I thank you for sharing your story and wish you the best in your endeavors in patient safety advocacy. 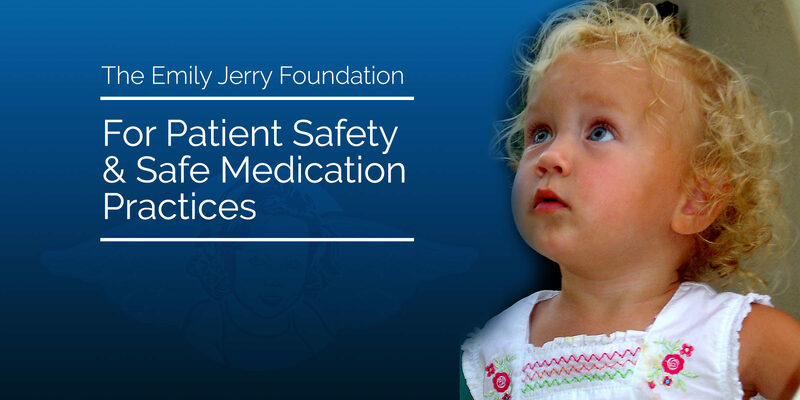 We are thankful for our friends at Pharmacy Purchasing & Products for highlighting our Emily Jerry Foundation Safe Label Program in their April 2013 edition. A small blurb appears on page 28/29 of the digital edition which can be viewed online by clicking here. The program incorporates the Blue Angel logo into software systems that print the medication labels. This image will help identify medications that are meant for children and need to be handled with the utmost care and precaution. This will in turn help lessen the human error component of medicine. We are very excited for the progresss of this program, as Medi-Dose/EPS took the first step, and we are now working on adding other manufacturers such as Codonics (whom we are in talks with currently) to add this safety feature to their technology as well. The following is an update on Florida’s pending Pharmacy Staffing Law – Senate Bill 818. Again, this irresponsible and deadly legislation was initially drafted by Senator Rene Garcia who obviously has a reckless disregard for the residents of the state of Florida, whose lives will be put in grave danger from medication errors, similar to my daughter Emily’s, if this ridiculous bill ends up getting passed! It’s time like these we need to hope the American system of government “by the people, for the people” will shine through. It is of the utmost importance that each and every Floridian and other concerned citizens around the nation contact these legislators and let their voices be heard. Click here to read the ‘Health News Florida’ story.